The parent category for coursework. Look again at Henri Cartier-Bresson’s photograph Behind the Gare Saint-Lazare in Part Three. […] Is there a single element in the image that you could say is the pivotal “point” to which the eye returns again and again? What information does this “point” contain? Include a short response to Behind the Gare Saint-Lazare in your learning log. You can be as imaginative as you like. In order to contextualise your discussion you might want to include one or two of your own shots, and you may wish to refer to Rinko Kawauchi’s photograph mentioned above or the Theatres series by Hiroshi Sugimoto discussed in Part Three. Write about 150-300 words. Looking at Henri Cartier-Bresson’s Behind the Gare Saint-Lazare and observing the way the different elements conduct the eye through the image and back, I would say that the pivotal point resides in the shades reflected on the water: the semi-circular figures, the railway and the blurred reflection of the man against the white surface. The top 2/3 of the image seem irrelevant, bringing little or no attention to it when I look at the photograph. Reflecting on Rinko Kawauchi’s image of an overexposed flower and comparing it with Bresson’s photograph, I can see why we are invited to analyse them together. As opposed as what it’s mentioned in the course materials about what “information” means in Photography and it’s connection with correct exposure (the better the image is exposed, the greater the information that is captured in the frame), it is interesting to note that in both images the component of engagement is represented by the less defined areas. In Kawauchi’s image for instance, the overexposed areas of the flower are an invitation to observe it more carefully, trying to unveil the information that hides behind the brighter areas. Since the object is a common one (I would assume it is a rose), the eye almost fills in the gaps using the information preconceived by our understanding of how a flower looks like. Also, hiding the real information on how this particular subject looks like (which could have been easily captured and delivered to the viewer with a perfect exposure and detail) is what stablished a dialogue with the audience and draws interest on to a simple object. Rinkokawauchi.com. (2016). Illuminance_eg. [online] Available at: http://www.rinkokawauchi.com/main/Illuminance_eg.html [Accessed 23 Jan. 2018]. The Museum of Modern Art. (2017). Henri Cartier-Bresson. Behind the Gare St. Lazare. 1932 | MoMA. [online] Available at: https://www.moma.org/collection/works/98333 [Accessed 23 Jan. 2018]. […] You may already have taken some homage photography where you’ve not tried to hide the original inspiration but rather celebrated it. Refer back to your personal archive and add one or two to your learning log together with a short caption to provide a context for the shot. Before I started this course I considered that drawing inspiration from other artists was a “bad thing”. I was scared of being accused of plagiarism if only my mind would register something from someone else’s work that would condition or add to my own photography. I see things differently now and since I am continuously looking for inspiring art to reflect and learn from I have become aware of how paying homage to an artists or work that you feel specially excited about is nothing wrong but a good opportunity to learn. Select an image by any photographer of your choice and take a photograph in response to it. You can respond in any way you like to the whole image or to just a part of it, b ut you must make explicit un your notes what it is that you’re responding to. Is it a stylistic device such as John Davies’ high viewpoint, or Chris Steele Perkins’ juxtapositions? Is it the location, or the subject? is it an idea, such as the decisive moment? Add the original photograph together with your response to your learning log. Which of the three types of information discussed by Barrett provides the context in this case? Take your time over writing your response because you”ll submit the relevant part of your learning log as part of Assignment 5. Although the two images are completely different, both have common elements such as the subject and the use of distortion. The main impulse of taking the picture was the universality of the symbolic neon sign which (sadly, I guess) could be recognised internationally and in a fraction of a second. The first time I saw Hatakeyama’s image, the one thought that came to me was that there are subjects that no matter how you disguise or distort them, they will always be easily spotted and understood by a wide audience, even if that is not your initial intention. I wonder what other viewers perceive from either of the shots. Even though Hatakeyama’s image is far more refined and encapsulates a finer and more interesting composition and colours, what I perceive is that there are symbols (not necessarily brands) that are so stablished in our everyday life that talk by themselves, no matter how you present them to the audience. 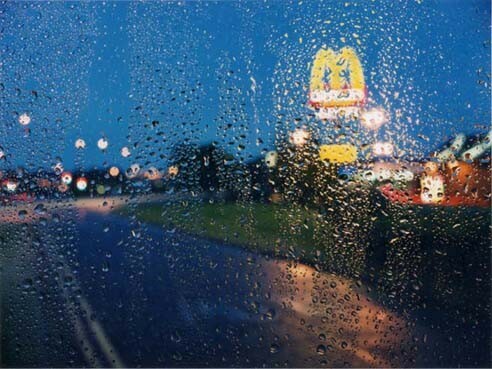 When you see his picture, you forget about the beauty of the “Slow Glass” series and think “oh, look, McDonald’s!”. It is a stone on the path, a thought you can’t avoid confronting at a first glance. This is the reason that provoked my response. I wanted to create a different image but showing nothing new to it, because the information sent by the subject itself is so strong that the intention of re-photographing it becomes almost pointless. Both images are taking the viewer to an undetermined part of the world but they can easily guess the look of the place, the smell, what kind of food customers are buying, the feeling inside the highly branded premises… the images themselves are sending lots of subliminal information that the viewer can relate to. When editing my image, I could have recovered most of the information from the white, blown up area that covers the name of the company however it is the “M” symbol the only element I needed to keep recognisable. The internal context (a McDonald’s store at night) is the main element I have given response to. Hatakeyama’s picture gives more information about the location and therefore it is easier to draw a more detailed idea of the place itself. My image focuses solely on the store, avoiding any other information, apart from the time of the day/night. The store I photographed was also situated beside the road (a busy one) and a change in viewpoint wasn’t possible with the lens used. Therefore, I have answered only to one aspect of the internal context which is the main recognisable subject on the image. The external context (information surrounding the image) would relate to the physical position of the image, wether printed, exhibited, published online… I believe that since Slow Glass has been published as a photobook, exhibited in galleries and it can also be found published online in art related websites, the external context of his image has much more to offer than mine, published on a student online log. Whoever comes across for example, the book “Slow Glass: Naoya Hatakeyama” would also see the picture as part of a series, nicely printed in a high quality publication, which would automatically reinforce and validate the importance of the piece. This would also influence the internal context, elevating something mundane to an image that worths considering as a work of art. The original context (how the picture was made), which was the main reason why I was shooting that night. I did not plan to emulate Hatakeyama’s style; I was working on my own project which started shooting in the woods with day light. The technique is different, yet there is some resemblance in the aesthetics. Hatakeyama focuses on the water drops that cover the glass, leaving the background out of focus while I manually focus on the subject to then place a textured glass over the lens. The original context is therefore very different if looked at it in depth, however, thinking of it in a simpler way, both have taken the shot by placing an object between the scene and the camera, so not sure how to judge this one. I guess it is only a matter of perception. Aperture Foundation NY. (2017). View from a Judgment Seat – Aperture Foundation NY. [online] Available at: https://aperture.org/blog/view-judgment-seat-quentin-bajac-conversation-philip-gefter/ [Accessed 6 Dec. 2017]. LAGalerie (2017). hatakeyama slow glass. [online] Lagalerie.de. Available at: http://www.lagalerie.de/hatakeyama7.html [Accessed 6 Dec. 2017]. Terrybarrettosu.com. (2017). Photographs and Context [online] Available at: http://terrybarrettosu.com/wp-content/uploads/2017/08/B_PhotAndCont_97.pdf [Accessed 6 Dec. 2017]. Use your camera as a measuring device. This doesn’t refer to the distance scale on the focus ring(!). Rather, find a subject that you have an empathy with and take a sequence of shots to “explore the distance between you”. Add the sequence to your learning log, indicating which is your “select” – your best shot. I am not used to shoot without “a plan” so I found this task a bit overwhelming at first. When Quentin Bajac talks about intention vs perception in the process of creating a photograph in the interview by Philip Gefter , I feel very much identified with the former. My process usually begins with the idea, which tends to change as I reflect on my intentions; then I plan the images I want to shoot, even though I am always open to the unexpected. I agree with Bajac that “what you produce in the end will probably be quite different from the initial idea.” (Quentin Bajac, 2013). Sometimes what you plan has nothing to do with the final result and I don’t see this as a problem since the end product tends to be better than the intentional shot, often a surprising finding that leads to further ideas. I wasn’t sure of my intentions or wasn’t looking for any specific results while approaching my subject but I am pleased with the sequence. I used a flash head on the left which I progressively moved opposite the subject. Images are shot in manual mode with the camera mounted on a tripod. By observing the shots I can see a pattern of thinking, from photographing the subject in its environment to going more into its details afterwards. There is a moment were the images could be described as portraits; the building of the character made up of boxes and the vertical frame combined with the flash light and the curtain as a backdrop reminds of this genre. In the end, the subject gets simplified to a minimum and there is a last shot were I felt like including myself in the image, which I see as a dialogue between myself and the subject: an interaction that goes beyond the expected. This is why I have chosen the last image as my select. I find that Image 13 resumes better the initial reason that made me chose the boxes as a subject. The inclusion of certain elements in the background (the opening of the curtain and the hook holding the tie back) seems adequate in the context, as connects the new place with the old one represented by the boxes. The legs could symbolise the beginning of new times although I would rather say it represents me as the individual transitioning from one point to another. I also find image 12 quite strong as the horizontal and vertical lines give lots of dynamism and both the old and the new are still represented however, I can only pick one image. Would be interesting to know what other people may think about the whole sequence without knowing what is it about. Aperture Foundation NY. (2013). View from a Judgment Seat – Aperture Foundation NY. [online] Available at: https://aperture.org/blog/view-judgment-seat-quentin-bajac-conversation-philip-gefter/ [Accessed 18 Jan. 2018]. Originally published on Aperture Magazine, issue #213, Winter 2013, Photography as you don’t know it. Assignment 4 : reworked. Artificial light. This series of urban landscapes intend to reveal an unusual view of what we could call the ordinary. Reflections and flares from artificial light imprint a cosmopolitan atmosphere on the picture but the overall distortion and brightness brings the element of the doubt: what is it that we are watching? By looking at the landscape through a textured filter, details get lost. The image softens and there are only two elements left on the frame: light and shapes. The resulting landscape feels unreal. It evokes memories or certain altered state of the mind which makes it difficult to identify the scene. The surreal sense of the images is accentuated with colour manipulation, creating a dynamic and bold set of images. After experimenting with different types of prisms and their effect when placed between the lens and the scene, I have achieved the best results with a textured plastic lid from a lemon saver container. Held over a 50mm lens it gave me the option to move it around in order to alter the detail gained in different areas of the frame. The camera was used handheld so there is some movement provoked by the long exposures and the cold. Colours were altered or enhanced using Selective Colour on Photoshop CC 2017, since I find that Hue/Saturation affects the quality of the image a bit more. I did not like the results and couldn’t get much variety of colours. I have also tried an urban setting during day time and did not find it inspiring. This is the reason why I have chosen to submit my Assignment 4 on Artificial Light instead. Assignment 4 has proven to be the most intricate so far because of the amount of shooting and testing involved. I has also taken a lot of experimenting, which I think has contributed to an interesting set of final images. Night shots can become a cliche if taken on a conventional way or if the viewer only gets what it is commonly expected from urban landscape at night. The images presented here are bold and vibrant, yet they were taken in a quiet location. An element that brings interest to these photographs is the element of chance, as the results are unexpected until the image is registered by the sensor. The variations are infinite for shape and colour, and yet the composition is neat. I would say this is a very creative set, at least for what I tend to produce. Shooting at night helped me step out of my comfort zone and this is something that I found helpful when trying to create. As I wrote on the previous blog, the work resonates with Naoya Hatakeyama’s “Slow Glass” series (pointed out by my tutor on the original submission). The artist I have been thinking the most while observing night lights is Rut Blees Luxemburg, as I started to feel intrigued about street lights reflections combined with the texture of the pavement and the constantly changing waves of colours that can be found at night. It was mid September when I first started shooting for this assignment and I am happy yo see the very many different approaches and routes that a project can take, even if it’s a brief set of images. From all the submitted work so far, I see this one becoming a long term project. I would like to introduce some variations and experiment with longer exposures and camera movement. Assignment 4: tutor’s feedback and some experiments. Overall I am happy with the comments and the impression that the images have caused. I am in the process of re-editing some of them and will be shooting in an urban setting next week, trying to include some people on the frame and hopefully getting a variety of colours to add some visual impact. My tutor has given me a few tasks to take the assignment further and this is the part I enjoy the most from the report. So far, I have been researching the artists mentioned and found them inspiring. Rolf Sachs’ landscapes taken from a train combine the movement captured by using long exposures with interesting distortions produced by the landscape itself: as the train approaches a curve the angle and the motion create an unexpected distortion that makes it difficult to guess how the images are taken. Naoya Hatakeyama’s series called “Slow Glass” depict night scenes seen through a wet glass, accentuating the lines and shapes created by artificial light. The simplicity of the scenes invites to guess what hides behind the “slow glass”, enhancing the interaction between the viewer and the images. As suggested, I have taken some night photographs using the same technique as for Assignment 4 (with the lemon saver container attached to my 50mm lens). I am extremely surprised with the results so far. I have selected some of the shots and enhanced or altered the original colours to add even more vibrance and dynamism. Although I am not planning to include any of these night scenes in the re-worked submission for Assignment 4, I am certainly interested in continuing with the project and add some more images regularly. I somehow feel the style of the images is far from what I usually shoot, specially in the use of colour, but I have found something stimulating that I enjoy doing. The abstraction of the images leaves some room to interpretation although some of them may look like something different. Most of the images were taken by pointing directly to the light source, which brought interesting geometric distortions. However, at the end of the experiment I started shooting pointing away from the light, increasing the exposures to capture a more atmospheric scene (as in the case of the fourth image of a sign on the pavement). This is something I have to try again next time, as I think it is more in the line of my work. I am really excited about this discovery and I can not be more grateful for having a tutor that pushes me to try new things. This assignment has opened my eyes even more to what can be achieved with an open mind. After practising with longer exposures I would also introduce some camera movement to see where this takes me. I am also looking forward to shoot with a pinhole camera. I believe the idea may resonate with what I am looking to achieve in my photography or it seems adequate at least from theory. I have never tried this technique and I will be hands on it as soon as I move house after the festive period. For now, I have read about the authors suggested by my tutor. Both Alex Yates and Tom Hunter use a pinhole camera to produce some of their images. The way this technique allows Yates to represent natural elements such as fog, lakes and clouds is what I feel attracted to when I see his images. In the same way, the blurred edges and softness achieved by Hunter on his “Prayer Places” series capture my attention and curiosity. The colour quality of these last ones feels precious and the general atmospheric scene wraps you inside it. We have also discussed the pointers for the next assignment, which has a rather general brief (this makes it even more difficult to choose a subject). I have some ideas in mind and I have welcomed both sources of inspiration suggested by my tutor. First, the blog Plenty of Colour is a good one to keep looking at from time to time. The images and projects presented show striking colour combinations and held a strong visual impact. Again, I am not sure how much I like colour or how could this reflect on my practice, but I have certainly a strange relationship with it. I am synesthetic in a way that words, numbers, shapes, times and other elements have “colour” in my head so I can be easily annoyed by certain colour combinations or the combination of an object with certain shape and certain colour altogether. I do systematically avoid colour in many aspects of my live (clothing, objects I buy, gadgets, decorative elements etc) or stay within a particular colour range in order to don’t feel “disturbed” by this condition (which is a great condition, I would say, I don’t complain!). This is one of the reasons why I feel a bit surprised with the experiment above and the colourful night scenes. The association my brain makes between colours and anything else in the environment make me perceive certain combinations as right or wrong, so the way I read an image has an extra dimension that comes to me spontaneously. I guess I could potentially be using this for an assignment or project one day, but the task of making others understand the feelings synesthesia bring and the way the brain processes these feelings seems a difficult one. There are other aspects of my synesthetic perceptions that could perhaps be easier to explain or represent, such as the shape of certain smells or names. Another task derived from my research for Assignment 4 is exploring the way Laura Plageman creates her modified landscapes and try to apply a similar technique onto my work. I have started experimenting with this, although it is still early stages but I will be writing about my findings and sharing the results in a separate blog post. -Alex Yates Photography. (n.d.). Home. [online] Available at: https://www.alexyates-photography.com [Accessed 16 Feb. 2018]. –Hatakeyama slow glass. (2001) [online] Lagalerie.de. Available at: http://www.lagalerie.de/hatakeyama7.html [Accessed 16 Feb. 2018]. -The Leica Camera Blog. (2013). Rolf Sachs: Camera in Motion – The Leica Camera Blog. [online] Available at: http://blog.leica-camera.com/2013/10/14/rolf-sachs-camera-in-motion/ [Accessed 16 Feb. 2018]. -Tomhunter.org. (n.d.). Prayer Places | Tom Hunter. [online] Available at: http://www.tomhunter.org/prayer-places/ [Accessed 16 Feb. 2018]. Assignment 4: Languages of Light. Reflection. Overall and in my modest opinion, I believe the resulting set of images for this assignment is interesting from a visual point of view. I find it engaging and intriguing in both narrative and technical approach. Technically, the decision of using certain camera settings has been done thoughtfully, fulfilling the demands of the assignment and helping to achieve the desired results. With the use of different external aids to create a mysterious landscape, I have shown that I am keen to experiment and develop an initial idea in a creative manner. The images from the set represent an atypical landscape that brings the viewer into the scene. The mood and aesthetics of each shot encourage the audience to use their imagination and interaction through their own interpretation of the landscape. This is a set of 8 images that works together as a whole, while each single image tells a story on their own. I feel the interpretation of the brief is satisfactory without being too obvious. The selection of a subject for Excersice 4.2 and its development has followed a natural path of research and experimentation with results that I have found very satisfying. Although the subject chosen is far from innovative, the techniques used and moreover the context in which this theme has been approach demonstrate a good degree of creativity. The images represent the landscape in a non conventional way, as a method to gain the viewers engagement with the set. By presenting intriguing and unexpected photographs the attention is brought to the questions “what am I seeing?” and “how was this photograph taken?”. I would say the main strength of this assignment is its originality and the balance achieved within the series. Aesthetically, the images seem very pleasant and inspiring. The softness and painterly effect achieved by placing a filter on the camera changes the way landscape photography is perceived by the general audience. It would have been quite easy to take an image of a forest and manipulate it to achieve a similar effect, but I am proud I have managed these results straight from the camera. I am not great finding weaknesses on my own work, specially because I would not have considered the assignment finished if I would feel something needs improvement, so I would leave this to my tutor to point out. As I have mentioned on the previous blog post, I feel a great affinity with distorted and modified landscapes. I have plans to visit this place many times in the future, as I will be soon moving five minutes away from it and I have already ideas I would like to try here. I have other glass pieces that I have acquired to experiment further with reflection and distortion. The observation and reinterpretation of natural environments stimulates my creativity as it is a landscape in constant change.